The QRF700 System lets you engage participants in virtually any situation. QClick software integrates with Microsoft Powerpoint, making it both easy and fun to use. 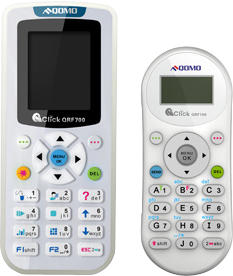 The QRF700’s all-new LCD screen and full alphanumeric keypad encourages classroom participation from every student. Compatible with Windows OS only. Normal Quiz, Paper Quiz, Homework, Rush Quiz, Elimination, Vote, Survey, and Freestyle modes included. Students can bring their work home and turn it in when they walk back into the classroom. Easily type short text or numeric answers. The instructor is freed from behind the computer to interact with the class.